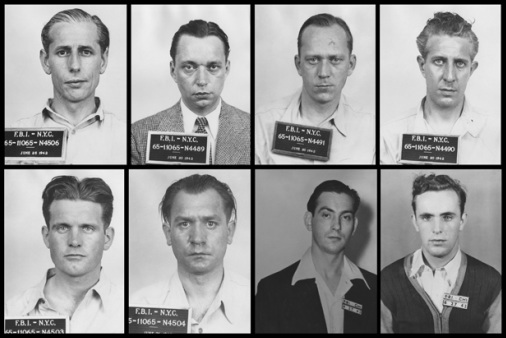 Mugshots of the German U-boat saboteurs. Photo: American World War II Museum. Four Nazi saboteurs departed a German U-boat submarine and landed on Ponte Vedra Beach carrying explosives and money. Their mission: To join up with four other saboteurs who had arrived at Long Island, N.Y. four days earlier and begin blowing up key infrastructure, including electric plants, bridges, train stations, water facilities and factories in the United States. It was a complex mission, and the men had been carefully chosen and trained. All eight had lived in the U.S. and two were American citizens. Over three weeks of intensive sabotage training in Germany, they were trained in the use of explosives and delayed timing devices. They were given background stories and encouraged to read American newspapers and magazines so they could pass themselves off as Americans. The first team arrived on Long Island on June 12, 1942. After changing out of their German Navy uniforms and burying them with their stash of explosives, one of the men was discovered by an unarmed Coast Guardsman. The guardsman reported the incident to his superiors but when an armed Coast Guard patrol returned to the site, the four Germans had already taken a train to New York City and checked into a hotel. A massive FBI manhunt followed the Coast Guard's discovery of the buried explosives but failed to catch the men. The four who arrived at Ponte Vedra Beach also buried their explosives and boarded trains to Chicago and Cincinnati. They planned to meet in Cincinnati on July 4 to coordinate their missions. That meeting never took place. While still in New York, one of the members of the New York landing team, George Dasch, confessed to another, Ernst Burger, that he had no intention of carrying out the mission and planned to reveal all to the FBI. Burger agreed that he, too, had been planning to betray the mission. Both men agreed to defect to the U.S. at once. After Dasch went to the FBI, all eight men were arrested, tried by a secret military tribunal, found guilty and sentenced to death. President Roosevelt commuted Dasch's sentence to 30 years in prison, and Burger's to life in prison because they had turned themselves in. The other six were executed in the electric chair in the District of Columbia and buried in a potter's field. In 1948, President Truman granted executive clemency to Dasch and Burger and deported them to the American Zone of occupied Germany.